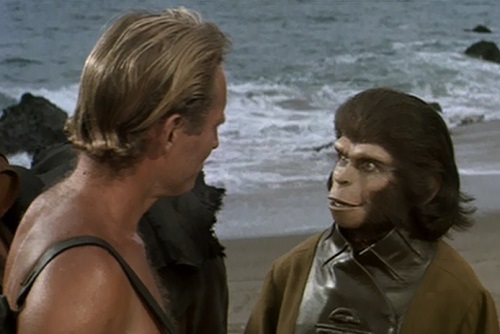 It’s no secret that Rod Serling co-wrote the screenplay to the original Planet of the Apes in 1968. That was four years after his signature TV series, The Twilight Zone, had left the air. I’ve heard people talk about the social commentary, twist ending, and other general similarities between Serling’s TV series and this feature film. 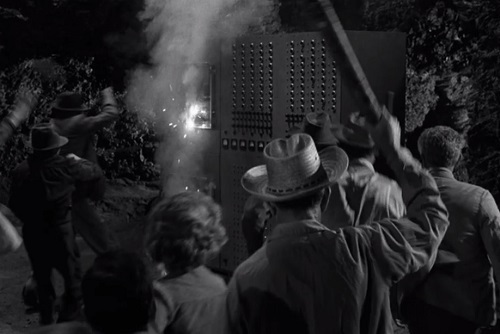 But I’d like to get into the details and show how six episodes of The Twilight Zone seem to have directly inspired just about every aspect of Planet of the Apes. Taylor and his shipmates are on a centuries-long interstellar journey, and they use hypersleep pods to survive long enough to reach their destination. 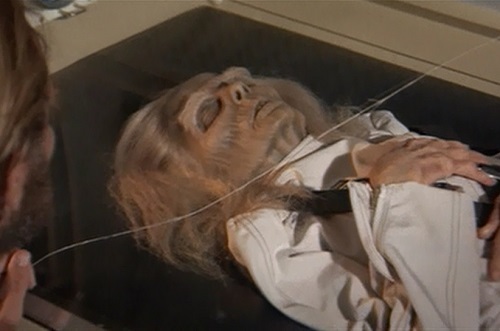 When Taylor and the other two astronauts awaken from hypersleep, they quickly discover that the sole female member of their crew is dead and her body has been rotting for ages. This resembles “The Rip Van Winkle Caper” where four thieves put themselves into suspended-animation chambers for 100 years after pulling off a big gold heist. 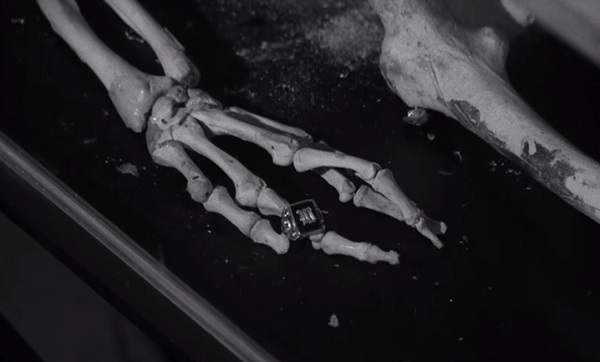 When they wake up they aren’t sure if any time has really gone by until they see that one of their companions’ chamber was breached and all that’s left of him are his skeletal remains. At first, the three astronauts wander through a desert on what they assume is an alien planet light-years from Earth. In the end, only Taylor remains alive and cognizant enough to learn the terrible truth that he has been on Earth the whole time, and humanity has devolved into a primitive race. He breaks down in anger as he gazes upon a ruined Statue of Liberty. In the classic episode “I Shot an Arrow Into the Air,” the three surviving astronauts of a rocket launch wander through a desert on what they assume is an asteroid. Distrust and murders ensue until only one man survives long enough to learn that they never left Earth’s atmosphere. 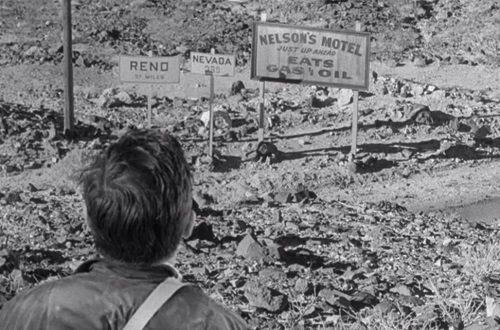 He breaks down in tears as he gazes upon telephone poles and a road sign for Reno, Nevada. Taylor stumbles upon a city full of intelligent gorillas, orangutans, and chimpanzees that have evolved to the point where they can communicate with him in English. They promptly place him in a cage with many other humans who have devolved into mute savages. In “People Are Alike All Over,” an astronaut lands on Mars and discovers the Martians look like humans. They can read his thoughts and are thus able to speak to him in English. He is the first human they have encountered, and they put him in a zoo because they consider him to be so inferior to themselves. Coincidentally, the astronaut is played by Roddy McDowall, who would go on to play an ape in Planet of the Apes. Taylor is put on trial before an ape tribunal that has been convened to decide his fate. The apes grill him over his origins and eventually decide to have him destroyed. But before they do, Taylor manages to escape and captures his prosecutor in an attempt to expose him as a hypocrite and reveal the entire ape society as unjust and backwards. In a dystopian future, a librarian is put on trial before a chancellor for being an “obsolete man.” He is charged with believing in God and is sentenced to death for his crime. He manages to trap the chancellor in a room with him as they wait for a bomb to go off, which will kill them both. He hopes to demonstrate the chancellor’s cowardice and thus the hypocrisy of the society he represents. 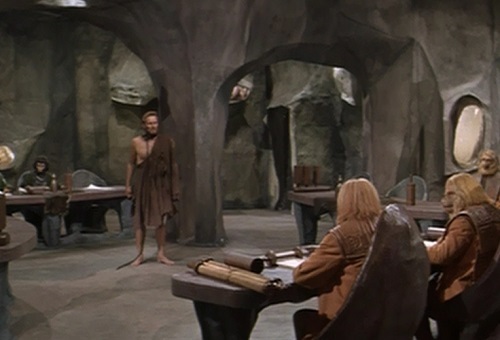 Taylor takes his ape prosecutor into a cave in order to inspect an archaeological dig that had unearthed clues about the apes’ and humans’ past. 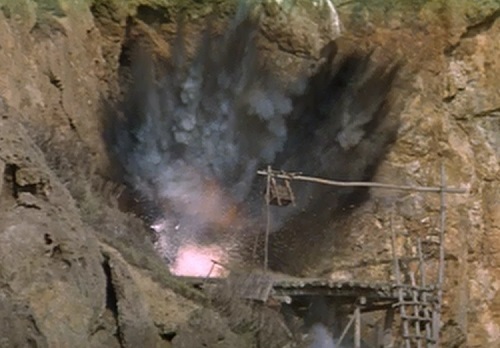 After they discover undeniable proof that humans used to be highly intelligent, the ape orders the cave to be destroyed. He says he is doing it to save the apes’ civilization. In the aftermath of a nuclear war, the leader of a small town regularly goes to what he describes as an “old man in the cave” to get valuable information that helps his townspeople avoid radioactive food and other serious problems. But the people eventually revolt and run into the cave where they discover the “old man” is actually a computer. They destroy it and seal their fate by eating the radioactive food they had been told not to eat. Taylor says goodbye to the ape scientists who helped him escape. He asks to kiss the female ape and she agrees, although before kissing him she exclaims, “But you’re so d@mned ugly!” Taylor then rides away from the apes on a horse with a beautiful woman to an uncertain future in the Forbidden Zone. In “Eye of the Beholder,” a woman undergoes surgery to fix her deformed face, but the operation fails spectacularly. In the end it is revealed that she is actually a beautiful woman while everyone else is hideously disfigured. She encounters a handsome man who promises to bring her to a group of outcasts who look like her. Pretty crazy, huh? I suppose it shouldn’t be too surprising. 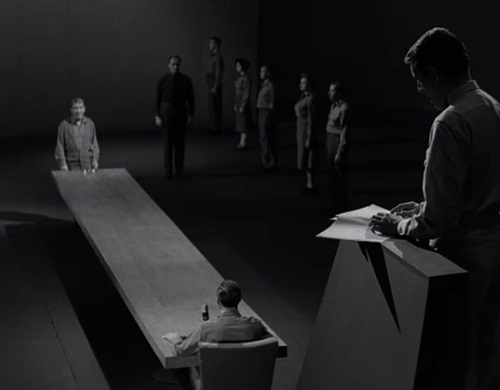 Rod Serling was a brilliant writer, so it only makes sense that he would borrow some of the fantastic ideas from his earlier work for this film. Of the six episodes I listed above, Serling came up with the stories for three of them and wrote the teleplay for the other three. Of course, the film was based on the 1963 French novel, La Planète des Singes, but it was changed dramatically from the source material during the writing process. If you haven’t seen those Twilight Zone episodes, I’m sorry for spoiling them for you, but you should still check them out and compare them to Planet of the Apes. Their stories are alike all over. 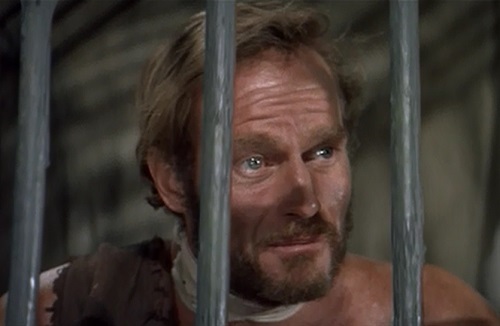 This entry was posted in Movie Matchups and tagged action movies, charlton heston, films, movie review, movies, movies based on books, movies based on tv shows, planet of the apes, rod serling, science fiction, the twilight zone, TV shows. Bookmark the permalink. 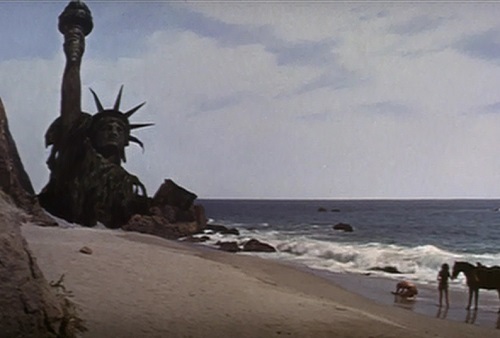 I loved the planet of the apes when I was a kid. I had a bit of a crush on one the apes. Which was weird. I’ve loved this movie since I was a kid, too. It’s just so interesting. I also like Escape from the Planet of the Apes. It’s fun to see the first film play out in reverse. Yes! It was Cornelius. Those films were a huge part of our childhood and of course there was the TV series as well. I remember The Eye of the Beholder episode! Great post-I never knew all those Twilight Zone connections. Thank you. 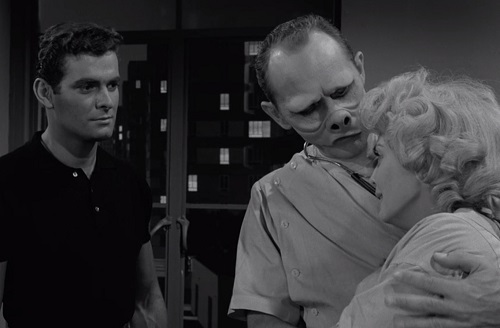 The Twilight Zone is such an awesome show. I even enjoyed the later incarnations of it over the years. Such classic, timeless stories. It’s really fun to see how well they translated into a film long before Twilight Zone: The Movie in 1983. Per Eyes of the Beholder, I would throw out that there was also a Night Gallery episode about a hideously deformed man who is somehow chosen to be a representative of Earth for a citizen swap with an alien race. Spoiler: At the moment of exchange, he passes a handsome surfer-looking guy in the space ship hallway (and the guy makes some sort of snide comment like, “Great! More of the same!”) and is momentarily depressed only to find himself greeted by a bevy of nurses who look hideous just like he does and they all seem smitten with his looks. I’ve only seen a couple episodes of Night Gallery, but that definitely sounds like an interesting connection. Crazy stuff. Thank you for mentioning it. I’m second to none in my admiration of Night Gallery (heck, that’s a pic of Serling on NG in my avatar), but the episode you’re talking about, “The Different Ones,” was pretty poor. 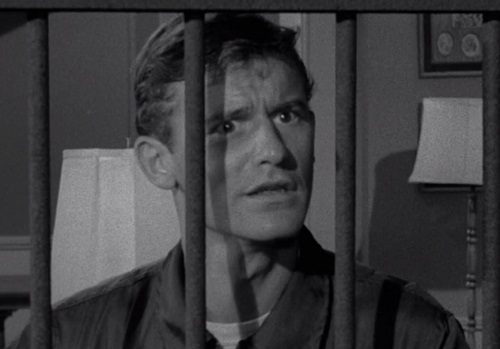 Even Serling, who wrote it, wound up disowning it. It makes a similar point to “Eye of the Beholder,” yes, but not nearly as effectively, IMO. But hmmm, you mention the ending, and I will say this: At least “The Different Ones” has a happy one! I have yet to do a post on “Planet of the Apes,” but I couldn’t help sharing this look at how its plot points can be traced back to six specific Twilight Zone episodes. Spoilers abound, of course, but if you’ve seen them all, it’s an intriguing theory. Enjoy! This article shows a remarkable lack of knowledge of the topic being discussed. Rod Serling did write a POTA film script, yes–but the one used for the movie was by Michael Wilson. Rod Serling’s version was rejected. And much of what this article discusses was added by Wilson, not Serling. So, no, none of these aspects came from The Twilight Zone. I liked Mr. Lockhard’s article, given my fondness for the Twilight Zone series, the 1968 Planet of the Apes movie, and the novel by Pierre Boulle. I don’t agree with the dismissive comment by “Dandru.” From what I’ve read, Serling’s work and treatment weren’t totally erased by Michael Wilson’s script (see the online article “Rod Serling’s Planet of the Apes script metamorphosis”). P.S. My apologies for misspelling Mr. Lockard’s name.